Have you ever looked at candles in a store or at a festival or farmers market and felt uninspired? Maybe the scents offered weren’t bold enough, maybe the container the candle was in was just boring, maybe the styling was a little too country for your tastes…whatever the reason, you just weren’t moved to the point of purchasing, or maybe you bought one just because you felt there wasn’t a better alternative. This is how we felt and was the driving force in our decision to start Vintage Candle Company. We wanted the complete package…a great smelling candle in an intriguing container with a styling that just felt right in our home. We strive every day to make candles that embody this philosophy. At Vintage Candle Company, we start with wine bottles that would otherwise end up in a landfill and re-purpose them for a new lease on life as a Wine Bottle Candle. Our bottles are hand cut and unpolished, giving them a rustic elegance that we’re sure you will be drawn to. Our candles are available in green, amber, clear, and blue bottles to match any decor and personal style. Next, we install an eco-friendly cotton and paper wick that is self-trimming which results in minimized mushrooming, soot, and smoke. Lastly, we blend our 100% all-natural soy wax with carefully selected, premium quality fragrance oil and hand pour your candle. We choose to use 100% all-natural soy wax because it burns cleaner than paraffin wax and holds more fragrance for a longer period of time. Using soy wax also supports US farmers. Our 12 ounce candles have been known to last 80 – 90 hours with amazing scent throw from start to finish. Our Vintage Wine Bottle Candles are finished with a high quality label that we personally designed to accentuate any decor. It features a premium black paper stock emblazoned with a damask wallpaper background and debossed with a green foil Vintage Candle Company logo. The combination of the hand-cut bottle and the elegant label create a shabby-chic look that is sure to be a conversation piece in your home. So we ask you…why settle. 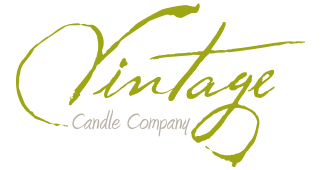 Indulge yourself with a Vintage Candle Company Wine Bottle Candle today.